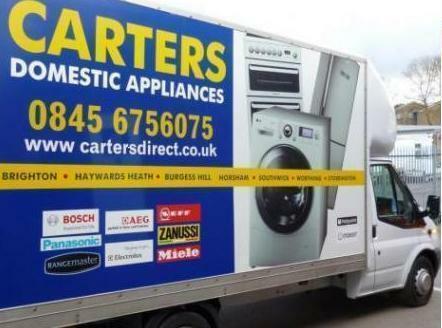 Our Euronics customers in Peacehaven are choosing Carters Domestic Appliances as their No.1 choice when looking for washing machines, tumble dryers, dishwashers, chest freezers, fridges, freezers, cookers and ovens of all types. Carters is a prominent member of Euronics, Europe’s biggest collective of independent electrical retailers with more than 10,000 individual stores allows us to purchase at the lowest possible prices and pass on the savings to our loyal, and growing customer base. We have six major stores including our flagship store in Preston Road, Brighton, just a few yards north of the Preston Circus junction, where you will find the Brighton Fire station and the Duke of Yorks Cinema. Whatever you are thinking of buying for your Peacehaven home, buying from Carters means we guarantee to give you award winning service, and the best possible deal on the day; either in store, or online. All of our sales staff at all Carters stores are well trained and able to suggest appropriate Euronics machines that would fit well in your home and lifestyle. They are conversant with the latest technology which gives your new appliance the capacity to operate in a way that gives you savings in utilities and in your pocket. Include us on your list of retailers and we believe you will be impressed that we constantly offer more than you can imagine from our range of domestic appliances sourced from world class manufacturers. We stock the freezers, fridges, microwaves, washer dryers and vacuum you can see in-store and on this website, in our 40,000 sqr ft warehouse facility in Storrington. This means that most of our deliveries can be cleared within 24hrs of you purchasing your new dishwasher from Carters Domestic Appliances. Our delivery/installation service to our customers in Peacehaven is second to none. We will professionally deliver your chosen model entirely free of charge and are able to install both freestanding machines and integrated models at competitive rates. We regularly deliver to area in and around Peacehaven, so look out for our blue and white vans on the day they come to you with your brand new Euroncis domestic appliance, selected from a range which includes AEG, Bosch, Hotpoint, LG, Neff and Zanussi. All our domestic appliances on sale include manufacturer warranties of one, two three , five, and up to ten years on some products. Further extended warranties are on offer to you to consider if required. Ask us about these extra services at the time you make your buying decision, and we'll advise as to the best type of extended warranty to further safe-guard your appliance in the unlikely (but not impossible to imagine) event of a breakdown. We pride ourselves on knowing our business inside out. Our Euronics sales staff are well trained and our delivery crews will ensure that your appliance is installed to as the manufacturers intended. It is refreshing to buy an appliance from a supplier who can tell tell you everything you’d like to know about it. Visit any of our stores open six days a week, and seven days at our Brighton superstore; browse our products here online, or call us at a store near you in Peacehaven.